It’s one thing to have your job permanently outsourced by your company. But what about outsourcing your own job? Is it entirely another to outsource your job yourself—by personally hiring someone to do your work for less than you’ll be paid when the work is completed (just as your employer-selected overseas replacement is certain to earn less than you, allowing your employer to pocket the difference)? If outsourcing is morally or legally good enough for corporations, why not for employees of those or other organizations? If your company can get someone else overseas to completely and permanently replace you and your job, why can’t you replace yourself, even if only partially or temporarily—especially when you aren’t getting rid of the company the way it would eliminate you by outsourcing your job overseas, given the right opportunity and incentive? You might even be able to defend self-outsourcing on the grounds that you may outsource your job to someone who is at least local or domestic and will spend and be taxed in the community or country where you work or be less likely to create national or corporate security issues by residing, say, in China. Despite reported cases of workers’ being fired or the prospect of being sued for outsourcing their jobs without permission, corporations seem to be held to a different standard legally, morally and logically—logically, because, unlike workers whose jobs have been outsourced, employers, by definition and solid logic, can’t be “let go” or otherwise dumped (neither by the affected replaced employees whose jobs vanish nor by those outsourcing their own jobs). After all, how can a company be let go by an employee it has let go? So, these kinds of asymmetries seem unfair and make the harsh treatment of self-outsourcing employees, e.g., being fired, seem puzzling. To serve the cause, definition and pursuit of workplace justice and to improve the odds of making a compelling case for self-outsourcing, an unassailable code of ethics for it should be a top priority. 1. NOTIFICATION: An employer is almost certain to argue that just as corporations and employers eventually inform replaced workers that their jobs have been or will be outsourced, self-outsourcing employees should eventually inform their employers that their assigned work will be or has been outsourced. When a job is outsourced by the employer, “eventually” can mean “just before or when the worker is sacked”; when the job is self-outsourced by the employee, “eventually” means “as soon as or after it is safe to provide notification”. Any time will be safe, unless the employer is likely to fire, replace or otherwise punish the employee for self-outsourcing (assuming no deficiencies in the execution of the job by the surrogate). In that case, an exception to and exemption from employee notification of the employer should be recognized—this exception being warranted by the comparable, otherwise asymmetric, immunity granted employers, namely, that the latter cannot be “let go” by the replaced worker for having done exactly the same thing: having outsourced work. 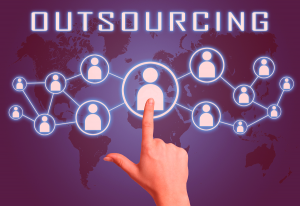 The outsourced work freed the self-outsourcing employee to do more productive work for the employer, i.e., more efficiently and cost-effectively than working alone would have. There is the recent story of “Bob”. the top-tier U.S. programmer who collected more than $200,000 for work he secretly paid $50,000 to have done by at least one gifted programmer in China; unfortunately he spent his delegated work time surfing E-Bay, etc., and therefore could not invoke this circumstantial defense. 3. MEETING PERFORMANCE EXPECTATIONS: Just as the work performed by an employer-outsourced replacement worker must meet the quality standards of the employer, the work performed on behalf of a self-outsourcing employee must also meet such employer expectations, if it is to be defensible. In the event that the self-outsourcing and/or outsourced worker’s standards are higher than the employer’s, and on the condition that the self-outsourcing worker is satisified with the “profit margin” in outsourcing, the highest of the three standards should be followed and encouraged, nonetheless allowing that meeting the employer’s standards may be sufficient. 4. FAIRNESS: Given that the outsourcing employer is entitled to pay one (outsourced) worker less in order to pay a replaced (originally insourced) worker nothing, the self-outsourcing employee morally should be entitled to pay another (outsourced) worker less in order to collect normal pay. One rationale for this is that in contracting to have an outside worker perform part or all of his job, the self-outsourcing worker is entitled to a risk premium (analogous to interest charged on loans, which are always, to some degree risky) to cover the possibility that his replacement worker may incur expenses, e.g., liability for damages or fail to perform to schedule or quality standards, necessitating hiring of yet another replacement to repeat or recover from the liabilities and other unplanned costs incurred. Moreover, like a recruiter skimming a legitimate commission from the pay of a placed worker, the self-sourcing employee is entitled to a bit of “vig” as compensation for the M.O.R.E.S. costs of his replacement (the maintenance, opportunity, replacement, evaluation and search costs associated with the hire). Finally, if “the profitable ends justify the means” or “whatever the laws of supply and demand allow” is the moral and business principle followed by the outsourcing employer, the self-outsourcing employee will have to be deemed equally “moral” by that standard. That would only be fair. 5. SUBCONTRACTING: An employer may argue that employer-outsourcing and self-outsourcing are completely different, because self-outsourcing is actually nothing more than sub-contracting (with or without permission)—an arrangement with the self-outsourcing employee playing the role of an unauthorized, compensated middleman. Hence, it will be argued, the rights, obligations and legitimate sanctions in the employer vs. employee outsourcing scenarios are not comparable, given the surreptitious nature of the self-outsourcing “subcontracting”. To this it may be replied that indeed employer outsourcing (without employee authorization, i.e., without consent) and employee subcontracting (with or without employee authorization) are different, but in a way that makes (even unauthorized) employee sub-contracting morally more defensible than outsourcing from the standpoint of “economic justice” (rather than profitability). That’s because employer outsourcing of an employee’s job obliterates both the salary and the position of the eliminated employee, while employee self-outsourcing, a.k.a. “subcontracting”, inflicts no such comparable damage on the employer, since the latter gets what was promised at the originally agreed-upon price. Moreover, the absence of deception or stealth on the part of the outsourcing employer is no measure of any moral superiority—being, instead, the result of, as the employer, not requiring such secrecy or duplicity, given that there are no sanctions an individual employee can bring to bear after discovering or being told he’s been replaced. 6. CONSEQUENCES VS. INTENTIONS: Whether self-outsourcing is “ethical” or not can hinge on whether the ethical standard applied is duty and intentions-based ( so-called “deontological” ethics, e.g., of Kant) or consequences-based (“consequentialist” ethics, e.g. the utilitarianism, of John Stuart Mill), which defines the moral rightness or goodness of actions by their results. From the intentions-based standpoint, the outsourcing employer is morally more culpable than the self-outsourcing employee to the extent that, unlike the latter, the employer has no intention of deceiving or lying to his employee(s—even if it’s only because he doesn’t have to. By contrast, the surreptitious self-outsourcer intends to lie or at least conceal his actions. Hence, the self-outsourcer is, by this reckoning, less moral than the outsourcing employer—a point that may be germane to legislation and law suits about the issue. A libertarian ethicist would counter with the observation that the only reason the employer doesn’t have to resort to fraud is that he has a monopoly on force—viz., he can force the replaced worker to take it and leave it (take the bad news on the chin and leave the job). He doesn’t even have to resort to persuasion, since he has all the power, which paves the moral high road of the employer’s superior intentions with the help of tanks. From the consequences standpoint, which judges the rightness of actions by their outcomes, the moral nod of approval goes to the self-outsourcer, if, as is commonly the case, the costs (disutilities) he imposes on the employer are far less than those imposed by the employer on the replaced employee. The consequence of, as an employer, having to pay what you agreed to pay for at least what you expected seems far less onerous than having to bear the shock of losing all of one’s income and the job that generated it. As to whether I, in good or bad conscience and having taught classes in ethics, would ever self-outsource the writing of any article of mine to someone in China, the answer is an unequivocal no. …Because I wouldn’t want to risk finding it on the shelves of Walmart before I got to publish it.